Right after Neil Young and his then-backing band the Santa Monica Flyers wrapped up the extemporaneous sessions that would eventually be shaped into the 1975 album Tonight’s The Night, they were invited to help christen the stage at the Roxy nightclub. It’s a mainstay on the Sunset Strip now, but in 1973, it was finding its virtual feet as a rock venue. And who better to help out than one of L.A.’s most famous sons (along with opening sets by Graham Nash and comedians Cheech & Chong)? 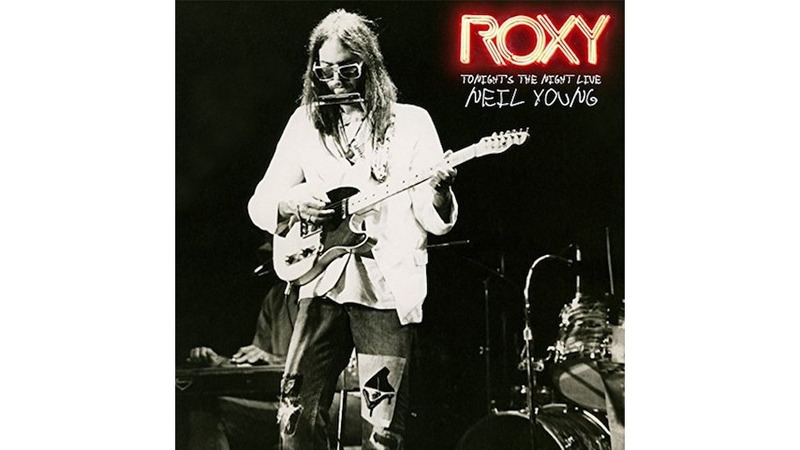 The set that Young and co. performed on that first night of the club’s reign, captured in all its glory on tape and now released as Roxy – Tonight’s The Night Live, features the entirety of the songs they had laid down in those sessions. They are, as you might expect, meatier and with more snap than the recorded versions, yet still lean and taut. There are no extended solos or long, drawn out moments of vamping. The band treats the show like a good club gig: playing their hearts out and encouraging the very vocal audience to join them in the fun. But this recording also feels like a sigh of relief, a joyous exhalation after spending long nights in the studio trying to musically soothe their souls that had been kicked around and bruised by the deaths of a beloved roadie (Bruce Berry, the man name-checked in the title track) and Crazy Horse guitarist Danny Whitten. Young and the Flyers—a group that included Nils Lofgren and his Crazy Horse rhythm section Ralph Molina and Billy Talbot—had finally freed themselves and the spirits of those two men from purgatory and were ready to bask in the glow of the stage lights and their fans’ applause. That’s evident in the tone of Young’s stage banter, a silly outpouring that makes reference to the burlesque past of the L.A. street and dedicates the anthem “Roll Another Number (For The Road)” to both David Geffen and the cops. There’s also an impromptu spin through “Roll Out The Barrel” for good measure. Mostly, the band’s joy is heard in the fervency of their playing. Again, they play the songs as straight as can be, with a mind toward the fact that no one in the crowd had heard these songs before. But the adrenalin (and surely other substances) coursing through their systems is evident through even the slow spirals of “Speakin’ Out” and the lazy ramble of “Tired Eyes.” The musicians come in just a hair too early or hit notes and chords with a touch more intensity as is necessary. And Young’s vocals are often just off enough, his voice occasionally cracking and just missing the note he’s reaching for. It’s the kind of humanizing moments that make live albums like this such crucial documents. Bring these gods down to our level, if only for a moment.